Capcom may be ready to announce a new "Versus" fighting game this year, but there's a catch - it'll only happen if Tatsunoko vs. Capcom sells well. Hey everyone, I've got good news and I've got bad news. What do you want to hear first? The good news? Okay! Here's the good news: Capcom may be ready to announce a new "Versus" fighting game this year, said Ryota Niitsumi - producer of the upcoming Tatsunoko vs. Capcom: Ultimate All-Stars - to Kotaku. 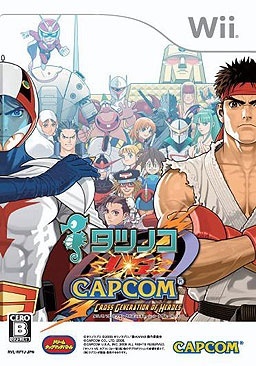 Tatsunoko is the seventh game featuring Capcom characters battling characters belonging to other franchises, having previously taking on the X-Men, the Marvel Comics cast in general, and warriors from rival fighting game manufacturer SNK. This is good because the Versus games are all generally really easy to jump in to (just not at a high level of play) and very irreverent and fun. Where else are you going to wind up with Jill Valentine fighting Wolverine fighting Mega Man fighting Spider-man? Where else are you going to get Darkstalkers' Dimitri turning SNK's Iori Yagami into a girl? The Versus games are awesome. Now, the bad news: This new game is conditional on Tatsunoko vs. Capcom selling well in the United States. The odds are stacked against Tatsunoko, seeing as how it's a fighting game for the Wii (ooh, off to a bad start), but - more importantly - half of the cast will almost certainly be completely unrecognizable to Western audiences. Tatsunoko's characters, like Casshan and Yattaman, might be instantly recognizable and iconic to Japanese gamers who have grown up with five decades of Tatsunoko series, but most people in the West haven't even heard of the company. Hell, the one character who would be recognizable over here - Speed Racer - isn't even in the game. Niitsumi said that the Versus games were largely driven by fan requests, which was something that his company paid close attention to. "Based on those requests we might be able to do something with our characters and another company's characters for a future game ... Keep your eyes open and your ears open for some kind of news in the future." That future, he elaborated, would be sometime this year if sales for Tatsunoko vs. Capcom "are really good." Unfortunately, I just can't see that happening. But if it does happen, I would gladly kill a man to see the Capcom fighters square off against the casts of Guilty Gear and BlazBlue. That's a crossover that's been entirely too long in coming.